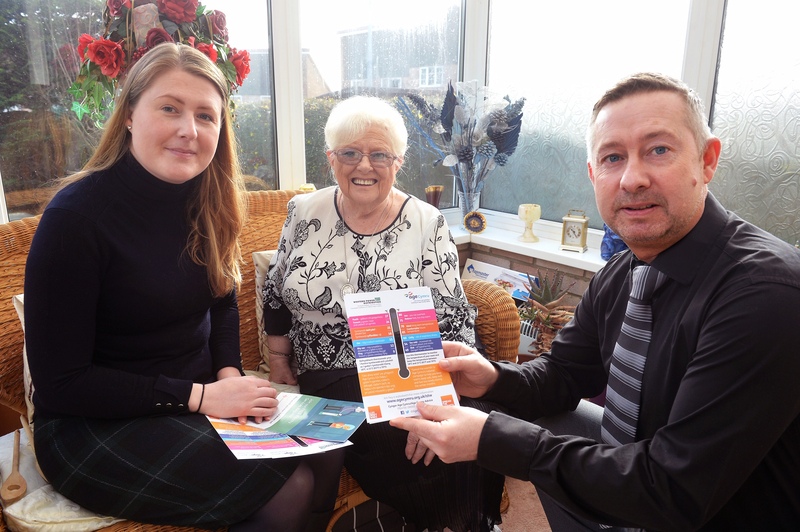 Abergavenny based pensioner Margaret Smeed, is this week helping to launch a simple to use thermometer card that reminds older people about the importance of keeping their homes warm and safe throughout the year. The specially designed card, developed jointly by the older people’s charity Age Cymru and electricity distribution company Western Power Distribution (WPD), warns older people when their homes become too cold and thereby a potential risk to their health. Research has shown that there is a direct link between excess winter deaths and cold homes. In line with the World Health Organisation, Age Cymru recommends that indoor temperatures are maintained at 21 degrees in living rooms and 18 degrees in bedrooms for at least 9 hours a day. The thermometer card warns that cold homes can lead to a respiratory illness and in extreme cases heart attacks, stroke arthritis, rheumatism and even hypothermia amongst older people who may not be able to regulate their body temperature as well as younger people. The thermometer card also has a list of handy tips on how to prepare for a power cut. It encourages older people to have access to a telephone that will remain working during a power cut as many digital or cordless telephones may not work. The card also urges older people to maintain a battery operated torch and radio so they can move around the home safely and keep in touch with news bulletins and updates.